NEW 2018 - Urban air pollution is typically characterized by high concentrations of ozone. This ozone is produced by well-understood reactions between (biogenic) volatile organic compounds (B/VOCs) and hydroxyl radicals (OH) in the presence of nitrogen oxides (NOx). Volatile organic compounds (VOCs) are reactive substances in the atmosphere which have a strong impact on atmospheric chemistry. Biogenic volatile organic compound (BVOC) emissions constitute approximately 90% of global VOC emissions. Environmental chambers to study interactions between Ozone, BVOC emissions and pollution were designed together with the University of Natural Resources and Life Sciences for the project UOZONE. All mounting and side parts in contact with the air inside the 40 l plant/reaction chamber are made from Teflon (PTFE). Pictures will follow as soon as the first model has been tested! Tanaka, P. L., D. T. Allen, and C. B. Mullins. 2003. 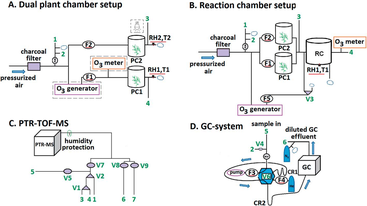 An environmental chamber investigation of chlorine‐enhanced ozone formation in Houston, Texas. Journal of Geophysical Research: Atmospheres 108.